If this will be your first time to own a beach cart, this Rio Beach Go Cart is one product that you should have. You can choose from hundreds of beach cart on the market. It is hard to decide what style and size will fit your needs. To make it easier for you to choose, it is best to set up a budget for yourself, depending on the features that you want to include in your cart as these items are expensive. Narrowing down your options can help you decide, and this buyer’s guide can help you. It is one of the best small go-carts that you can use to carry essential things. The weight capacity of Rio Beach Go Cart is 50 lbs. Also, it has a rack, bottom tray, and mesh pouch to carry various types of items. It can bring three beach chairs. Rio Beach also has a bungee cord to keep everything in place. After using it, you can fold it and store it in a safe place. You don’t have to worry about the price since it is very affordable. It has mesh pouch, rack, and bottom tray. The fabric used is durable and easy to clean. People would love to have something that requires less maintenance and easy to clean but is very sturdy to last longer. 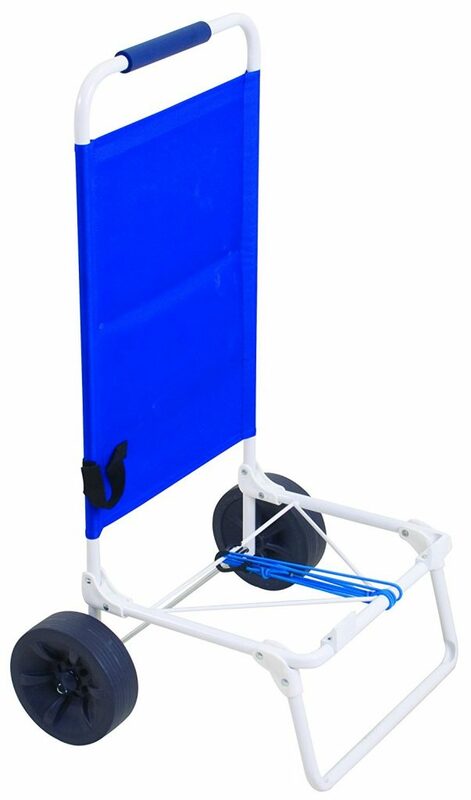 The cart is made of nylon fabric that is considered a material that is easy to clean even by just running water over them and do some scrubbing. The size of the wheel is one feature that you need to check as well before buying. The Rio Beach Go Cart has regular sized wheels thus it can carry only around 50 lbs. If you need to transport heavier items, choose the one with bigger wheels as they can carry up to 150 pounds. It can transport light objects only up to 50 lbs. The Rio Beach Go Cart may not be the best beach gear for you, but it can surely help you carry your light things without any problems. The material it is made of is very impressive and easy to clean. If not in use, you can just fold it and place it in the cabinet. You can complete your transporting task fast and with less effort.